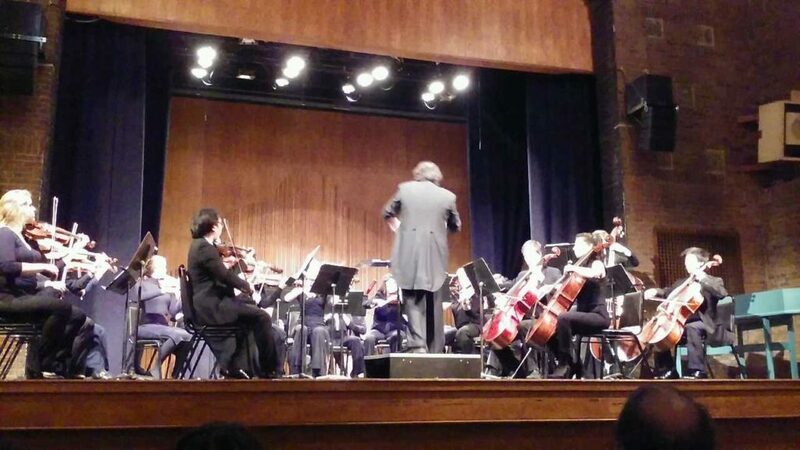 Catholic’s music director, Maestro Tartaglione, opened the show with a few enthusiastic remarks, taking the time to highlight the beauty of the Brandenburg concerto and the talent required to play the concerto’s trumpet solo. He introduced Sunday’s trumpet soloist, Andrew Balio, by stating that he was one of roughly twenty musicians in the United States who are capable of playing the part. From the beginning of the concert, the audience could tell that they were about to witness something special. Classical music orchestras are one of the largest and most varied ensembles in the musical world, At Sunday’s concert, this diversity was represented by a large violin and viola section, a wind section, and, at one point, a harpsichord. Throughout the cheerfulness of the Schubert overture, the fast-paced joy of the Brandenburg Concerto and the melancholy of the Mozart symphony, listeners could see that the members of the orchestra must complement and play off of each other in order to produce the music. Each performer must maintain a sensitive relationship with his or her own instrument as well as with the rest of the group. Emotional appeal may be the most engaging aspect of orchestral music for a novice listener. On Sunday, this appeal was never more exhilarating for the audience than in the Brandenburg Concerto. The work is full of intricate harmonic moments that one has to study for years in order to properly understand. The end result, however, is a profound portrait of human moods and thoughts, something that speaks to everyone. Orchestral music does not have any lyrics, making this style more abstract than vocal music. Nevertheless, each instrument has an expressive voice, and is capable of leading listeners through many different emotional arcs. The audience was able to intensely feel of each instrument’s character and temperament. When multiple instruments play together, the listener has the opportunity to experience a three-dimensional study into a single feeling. This was heard especially in the Brandenburg Concertos ongoing trumpet section. The brilliant solo depends on much higher notes than what is usually found in trumpet music, making the horn sound more like a giddy bird than an instrument. Andrew Balio’s musicianship was in full glory during this solo. His tone was effortlessly airy and bright, without any of the brazenness that is typically associated with horns. Balio was able to make the trumpet sound like a wind instrument. His agility allowed the trumpet sound to bounce off of the roles of the violin, flute, and oboe solos in cheery triumph. His solo gained its strength from the rest of the orchestra, beautifully showcasing the teamwork so vital to orchestral music.